I think BGP is being used for people multihoming their sites onto the Internet, hence the explosion in the size of the Internet Routing table and /24 advertisements. 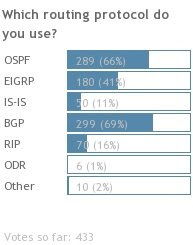 BGP usage has taken off in the Enterprise due to the migration to MPLS from frame/ATM. In my experience, many companies have taken paths to avoid BGP, only to find later that it provides the best solution in an MPLS-based network, and especially in a dual-carrier MPLS environment.